While other survivors blame lax gun laws for the shooting that claimed 17 lives in a Parkland high school, 15-year-old Anthony Borges finds fault elsewhere and wants his point of view on the record. The Marjory Stoneman Douglas High School student, badly wounded while saving the lives of classmates, has blamed the Valentine's Day mass shooting on the sheriff and the school district. He says confessed gunman Nikolas Cruz should have been kicked out long before the deadly rampage. This is a courageous young man. Courageous during Cruz's shooting spree, courageous after it. He was talking about the PROMISE program, aimed at keeping disruptive but non-violent students in school through counseling and restorative-justice methods. 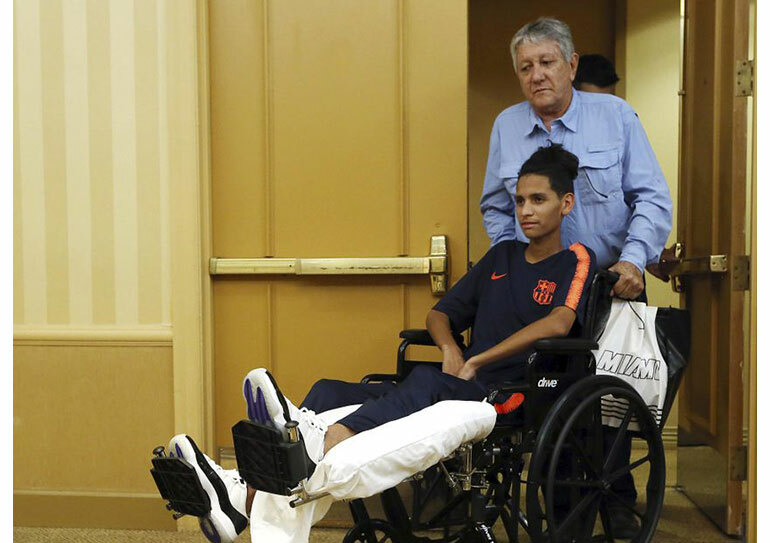 The letter was read at a Friday press conference in Plantation by attorney Alex Arreaza as Borges, in his Barcelona Football Club jersey, sat next to him in a wheelchair. The boy is still too weak to talk after being released Wednesday from a Fort Lauderdale hospital seven weeks after the shooting. How much coverage will a gun-obsessed mainstream media give Borges' plea? Gun control has dominated everything post-Parkland. As if there are no other issues that define this tragedy. In fact, the push from the left is to ridicule Gov. Rick Scott for putting emphasis on school safety measures instead of just on more gun control -- they call it "political expediency in an election year." The decision by the boy and his family to focus on Broward County’s move away from traditional discipline comes as a marked common-sense departure. Five years ago Runcie, allied with Obama Education Secretary Arne Duncan, adopted a plan designed to end the “school-to-prison pipeline” by reducing suspensions, expulsions and arrests. That plan was embraced a year later by the Obama administration in its 2014 guidance on school discipline. Cruz, 19, has been charged with 17 counts of first-degree murder after freely entering the school unobstructed, after he was so coddled through his high school years he couldn't even legally be kept from buying a firearm. Though there are protests seeking Sheriff Israel's resignation, there are no marches demanding answers from local authorities. Authorities throughout the Broward community, as well as the FBI, amassed a thick file of disciplinary infractions on Cruz, including the threats he made, the fights he instigated, the bullets he brought to school in a backpack. He was shuffled to different schools but never expelled, according to discipline files obtained by the Miami Herald. Deputies had also responded to frequent calls at his home. Yet, in spite of all the paper on him, the fear of him expressed by neighbors, classmates and their families, all the personal knowledge of his actions law enforcement had in their possession, Cruz was able to avoid a criminal record, allowing him to pass a background check and buy the AR-15 used in the shooting. By filing civil lawsuits against Cruz, the estate of his mother Lynda Cruz, who died in November, and the family that cared for him after her death, the Borges family is starting a mini-movement of its own. Under Florida law, no lawsuits can be filed against the Broward County Sheriff’s Office or Broward County Public Schools for six months after the shooting. Called "Ironman" for his feat of bravery, Anthony Borges has brushed off the label. “While I am honored to be called this, I am not. I am a 15-year-old who was shot five times." Arreaza said the boy supports his classmates who have become national figures for their stance against assault weapons, but that their chief focus isn't his. Also, Borges' father Roger Borges, born in Venezuela, relates to experience from his country of birth and said he doesn't believe protest marches are the thing that will improve school safety. True, the school district has said Cruz wasn't part of the PROMISE program. Yet, he got the same hands-off treatment as students who were part of it and so far, no one has said why. As Anthony Borges continues to heal, hopefully more of the mainstream media will pay attention to the direct and honest message of a real hero of Parkland. Jerry, if you can’t buy a gun legally, it is illegal to buy one at a gun show or any other way. What we need is local, state, and federal law enforcement to bring the hammer down anyone who tries to buy and is declined. Just refusing the sale on paper is not adequate. Without serious consequence people who KNOW they are not eligible will simply keep trying until they succeed in their acquisition. And yes we need more attention for states to properly provide NICS with data on adjudicated mental health questionable persons. Must be done with full due process. Nancy you know it is a lie saying the students only blamed gun laws as most blamed the many other reasons too.................. Vs you are trying to make this up to keep gun regulations down..............The shooting had many reasons and likely the biggest is gun laws that kept the police from doing much of anything until the shooting. ................ And the shooting proved a cure for a bad guy with a gun is a good guy with 1. .............. There was a trained cop on site that hid like a coward he was................... Fact is Cruz even with a blocked gun permit can legally buy guns from people, gun shows repub won't budge on that allow anyone including terrorist to buy them.............We need far better background checks with better mental health, violence information on ALL gun purchases repubs have stopped, a $50/yr tax on each gun, no more than 6 round /gun before having to reload, any gun stolen owners are responsible for what it does .................... Next we need more mental healthcare and the CDC to study gun deaths which repubs stopped. ...... Don't you see the trend, smart ways to do it and repubs blocking it every step of the way causing more deaths including Parkland if you want to blame anyone, repubs are it. . So much is so wrong with this post Jerry but nice leftist lies. Cruz had a "blocked gun permit"? Where did you read that. What a lie. Had the system already been in place properly utilized he never would have been able to purchase a gun. '$50/yr tax on each gun, no more than 6 round /gun before having to reload, any gun stolen owners are responsible for what it does.' nice leftist dreams. It will never happen. I have a speed re-loader for my revolver and can reload in 5 seconds. GUNS DON'T KILL PEOPLE!! PEOPLE KILL PEOPLE!! What do you want next? Ban knives like London? Knives kill more ppl than rifles. Your argument just doesn't make sense.